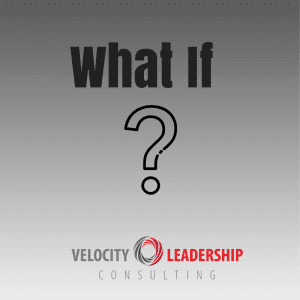 “What If” questions are a powerful tool in the arsenal of unlocking higher performance, particularly in leadership. Often we find ourselves in situations where “what if” questions can literally unlock new ideas and eventually solutions. You (or one of your leaders or team members) are trying to achieve something at work, and it’s just not happening. Perhaps you find yourself thinking on a regular basis about the reasons why it’s not happening. And each time, you come to the same conclusion – just not going to be possible. In fact, test this out with the thing in which you’ve come to this conclusion most often. Your unconscious mind is stuck in the pattern of thinking of all the reasons why you can’t do it. And, it’s preventing your same unconscious mind from being able to see ways that it can be done. Who was it that said, “every problem has a solution?” I looked it up and it’s actually many notable historic people that said this, but I digress. The point is, it’s true, and we can all agree it is. By asking “what if” questions, limiting beliefs are interrupted and possibilities are opened, like rays of light coming through window blinds in the morning. “What if” questions establish new neuro pathways (patterns) of performance. It’s like going a bit longer distance each time, ultimately being able to run a marathon or Ironman. Literally open the door up to all of the ideas that come streaming in. Let yourself go with it. Make an exhaustive list until every time you ask the same question, you have no further ideas. Spend more time on “what if” questions than why I can’t. Physically time yourself on this part. If you spend 20 minutes thinking of all the reasons why you can’t do it, spend 20 minutes writing down all the ways that you can do it. If you are leading yourself, get into action on the most plausible way you can do it. If you are leading others, ask them what they see as the most plausible, or even, fastest and easiest way to achieve it. And then, get out of their way. This is a powerful tool that high performers use over and over, making it look easier for them to achieve greater results. And it can be easy for you, and those you lead too. Just tap into your unconscious mind using “what if” questions and ride the velocity to the achievement. Rinse and repeat.